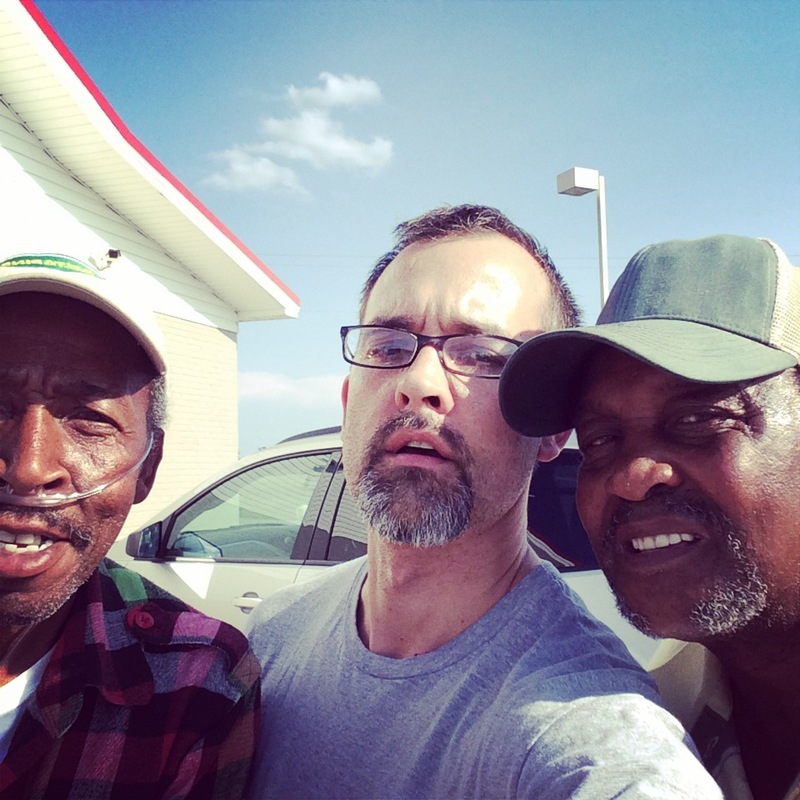 This is me straining to take a selfie with the two men who helped me when our truck had a fuel leak somewhere in South Carolina this spring. The one on the left pulled an oxygen tank around with him, and the one on the right climbed right under the truck without a second thought. Two kinder gentlemen I don’t think I’ll ever meet. We scrambled out the door the way families do in order to get to church, with our youngest daughter proclaiming in a panicked voice, “I forgot to brush my hair!” and our middle son still protesting the decision to drive the five blocks (instead of walking through the rain). We crossed the street in frantic fashion and tumbled inside the truck. Because we drove, we parked at the library and walked through the cemetery, then dashed through the rain while Maile fed Leo before coming inside. Slightly wet, we took a seat at the back of St. James, just as the music began. We take up an entire pew now, the seven of us, and I can become slightly obsessed with trying to maintain order in that small space. Abra leans back and bumps her head against some poor woman trying to pray behind her. Sam drops the hymnal with a bang. Finally, the children go to their class and, since Maile hasn’t yet come in, I’m sitting alone. There is the reading from Matthew. Then the prayer. My insides feel scattered. My heart is not centered. But the person leading the prayer says one word that captures me. He prays for peace, and when I think of the turmoil there, swirling in the Midwest, I find myself getting emotional. There is a dead young man, and a community torn, and chaos. There is violence and there are deep wounds. Suddenly the chaos in my own life seems slight in comparison. But what can I do? I ask, and above me the church stretches high in the air and the light filters in through the stained-glass windows but all I can hear is the silence between the prayer and the response of the congregation. Lord of mercy, hear our prayers. We drive home and we stop to get a card for my cousin and we go by the market to pick up some eggs. The four oldest kids play a game of Life together while Maile works on a few projects and I take a nap. Then Sam, five years old, comes up to the bedroom and joins me, his blanket in tow. He looks like Linus from Charlie Brown, sucking his thumb, and he curls up against me. Soon he is asleep. What did I do to deserve such peace? And what can someone as insignificant as me do in the face of such chaos, such confusion? What can I do to help a place like Ferguson? There is an African-American man who lives across the street from us. He looks to be about sixty. He sits on his porch just about every day, watching the traffic go by. When I sit and write on the front porch, I wave to him, and he waves back. My mother-in-law, much more of an extrovert than I am, has already met him and spoken with him. She said he’s on dialysis. She said he’s a very nice man. For quite some time now, I’ve been thinking that I need to cross the street and talk to him, get to know him. Yesterday I wondered what he thought about Ferguson. I wondered what his teenage years were like in the 60s, where he lived, and what he saw. This, I think, is the answer to the question, “What can I do about Ferguson?”: I can cross the street. This is not all that I can do, and it feels like such a small thing, but it also feels like the place for me to start. It reminds me of the men who helped me when our truck started leaking fuel in South Carolina. There I was, stuck at a gas station. They didn’t have to do anything. But they walked over and did everything they could to help get me back on the road. What are you doing to bring reconciliation to the world? To Ferguson? What else can we do?